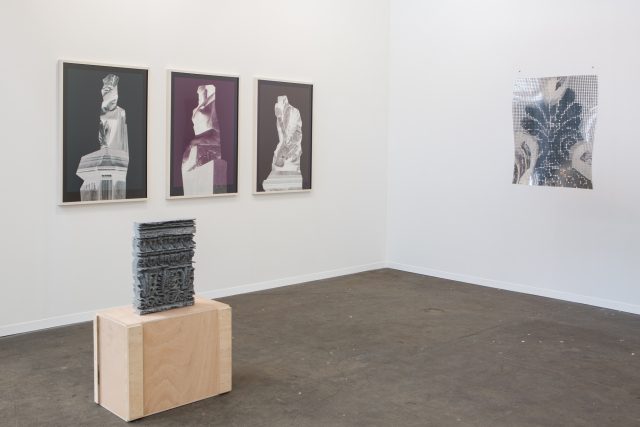 For Art Brussels 2016 Neumeister Bar-Am present a duo booth of contemporary artits Spiros Hadjidjanos (Greece, 1978) and Henrik Strömberg (Sweden, 1970). Hadjidjanos and Strömberg are interested in reanalysing historical images, monuments and ornaments through a contemporary lens. For Hadjidjanos this lens is using technological advances in material production, employing innovative methods such as 3D Printing and materials such as ALumide and Carbon, while Strömberg works with digital and traditional photographic manipulation, in this series specifically cutting negatives of monuments to create abstracted and emancipated forms. Both artits work with structure and image to re-envisage, question and awaken historical views while also engaging with the present use and meaining of the content they use. They are interested in a translation, or transmission, of physical to flat, old to new, and vice versa, confusing and embracing these dichotomies.